Trevor Noah is currently the host of the Daily Show on Comedy Central. Previous host, Jon Stewart, was a tough act to follow and Noah has done very well. He seems like a regular guy, right out of South Africa, so he’s got that impressive accent and that smiley sense of humor. Then you read his new biography, and you just shake your head in wonder. Who could possibly know? Born under apartheid of a black African mother and her white Swiss lover, it was literally against the law for those two races to have a child. Punishments were severe; thus the title, BORN A CRIME. 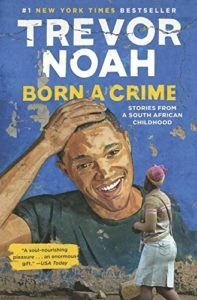 Noah goes to great lengths to portray the harsh regulations put in place by the Afrikaners to keep the black majority in line. One was to separate the different tribes and keep them distrusting and fighting with each other. Another was a ban on interracial coupling; another was job stratification so that blacks and coloreds (who were mixed racial or of lighter skin) could only get the most menial jobs. “Racism is stupid,” Noah says and goes all out to prove it. This may be an autobiography, but Noah downplays his eventual career success, barely mentions it. And there’s no doubt who the hero is. It’s Noah’s mother, who was willing to take a white man as a lover, bear his child, and then do everything in her power to make her son strong and educated. She’s tough (amazingly tough love) so much so that when Noah is arrested for a driving his stepfather’s car without a registration (so the police, of course, think he stole the car), he’d rather go to jail than to go home and face the wrath of his parents. Mom’s work ethic, her morals, her unflinching Christian faith in the face of unbelievable practical and philosophical obstacles, her survival of a marriage to an abusive husband who ends us shooting her, only to see her save by a miracle, these are the force that shapes the man. And he laughs through it all, as he tells of the horrors of abject poverty, how he was able to dodge the complex racial repression of Apartheid, of life as a hustler in the hood, the dangers from kids from other tribes, the difficulty of getting and meeting girls, the power of different languages and how knowing them is a clear ticket to inclusion. What a story.